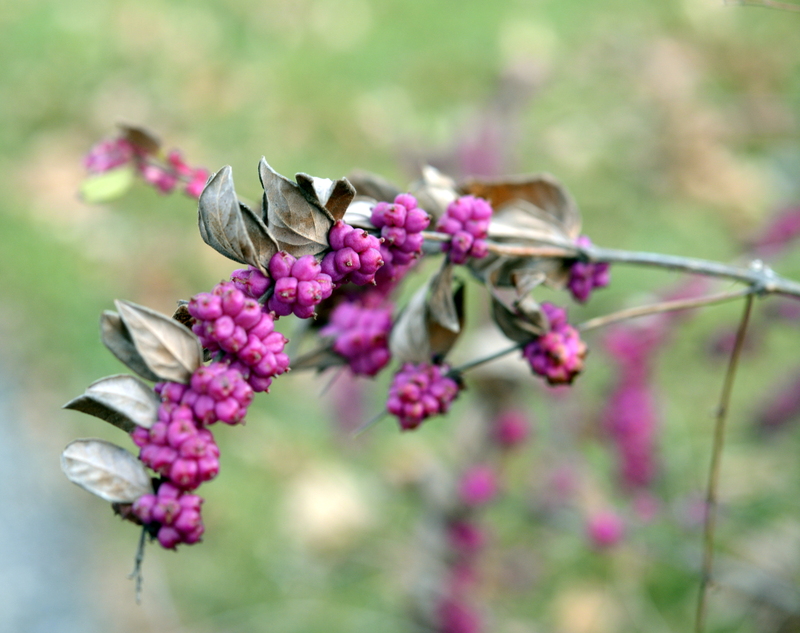 Black chokeberry (Aronia melanocarpa) is a wonderful all-around native shrub for fall color, summer fruit, and spring flowers. Today’s NY Times carries a terrific opinion piece about how very, very complicated nature is and how hard it is to intervene. I encourage you to take a look. And then perhaps read my screed on not feeding the birds. Something to think about. 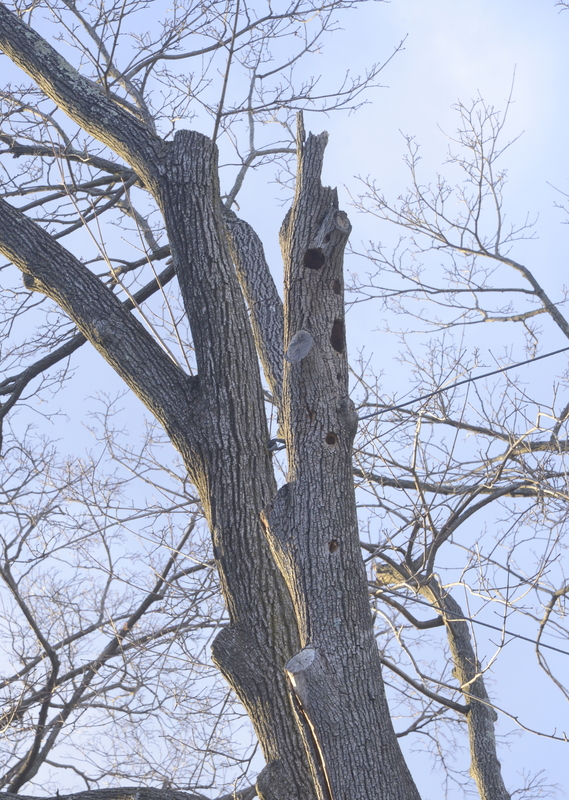 Look at all those nest holes! I refer to this tree as the condo. 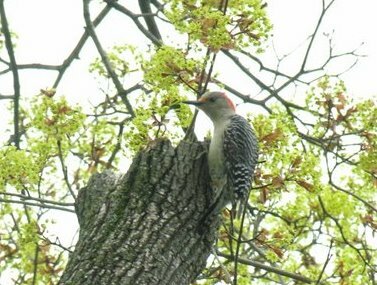 The bird activity in the area is continuous, and there are lots of wood chips on the ground. This Norway maple is slowly succumbing to wet rot. 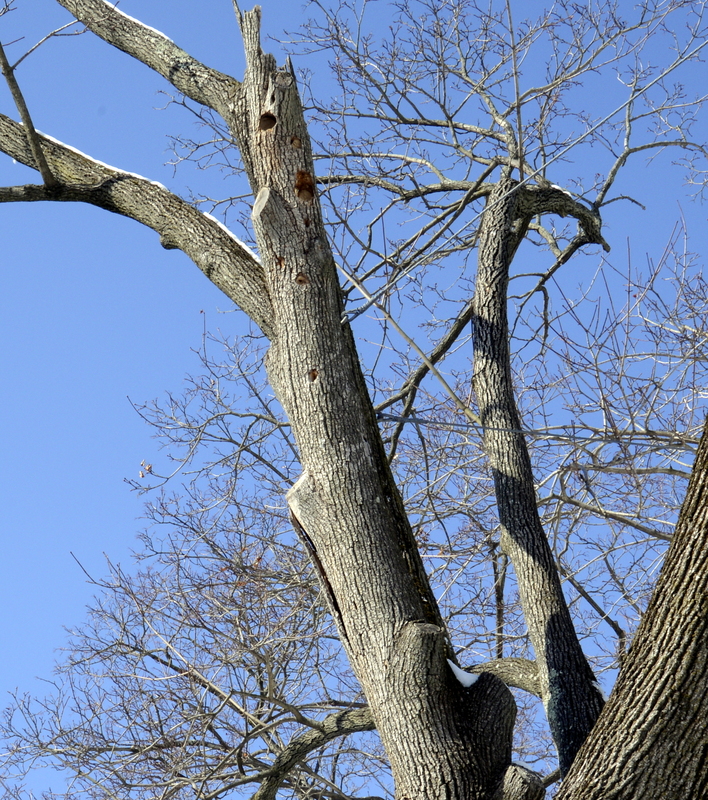 As branches die, we have them removed if they pose danger to people or property. Otherwise we leave them in place, although we sometimes cut them shorter, again, if they might cause danger. This branch was cut shorter in 2008 and has been continually inhabited at least since then, but there still must be vacancies. This picture was taken on March 4, 2014, one year and one week ago. But today I saw the same scene–a small flock of newly arrived robins looking for food on the few spots of ground that are bare of snow. 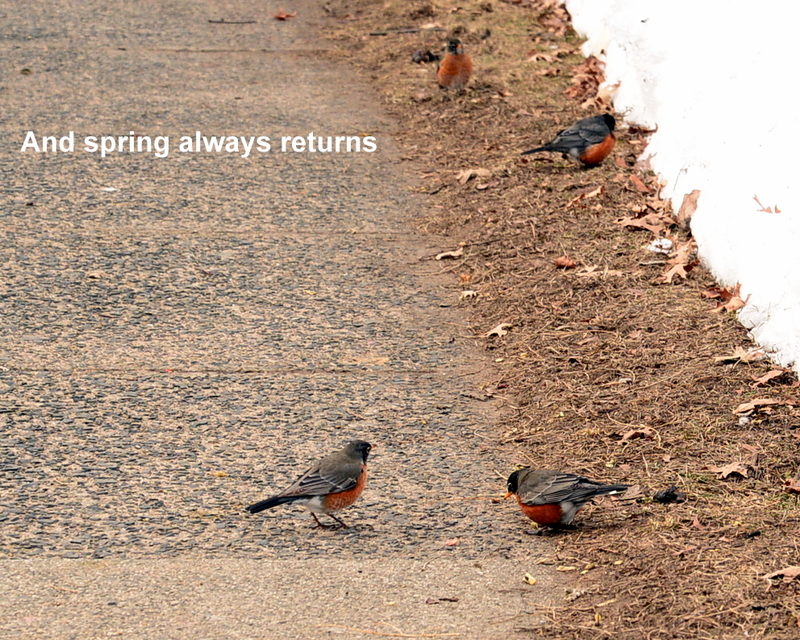 (Check out the Robin Watch website for up-to-date news about this year’s migration.) So at this point, it looks like we’re about a week behind last year’s exceptionally late spring. 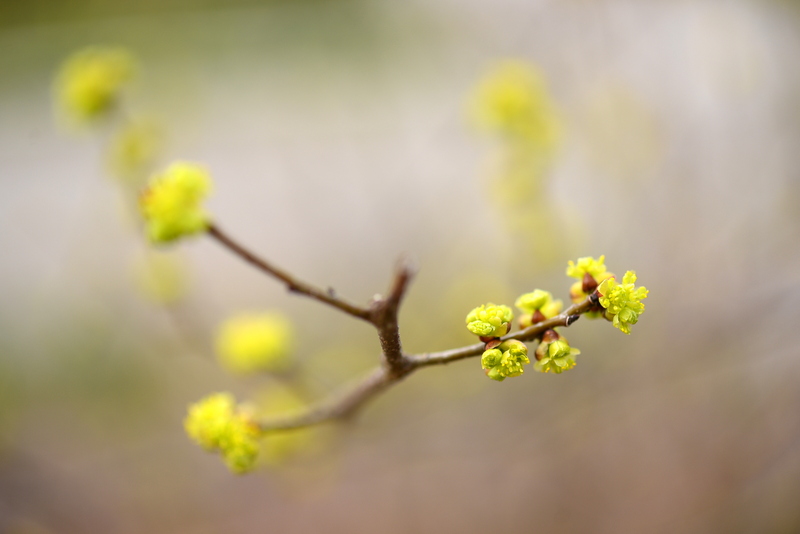 Based on that, because phenology tells us that natural events tend to happen in a set sequence, I’m predicting that crocuses will be in bloom in about a week and native hazelnut shrubs and spicebush in 10 days to two weeks. Check back here to see if I’m right! And don’t forget that it’s time to start seeds of many warm-season vegetables indoors, including, finally, tomatoes. Addendum: Today’s NY Times features an op-ed piece by Doug Tallamy about the environmental value of native plants. This majestic creature perched in the large maple in our backyard for over an hour this morning, slowly surveying the area for prey. I hope it eventually got a nice big rabbit. My husband, who is reponsible for all the good photos on this blog, took over 100 pictures from a second floor window. ID help once again, please! 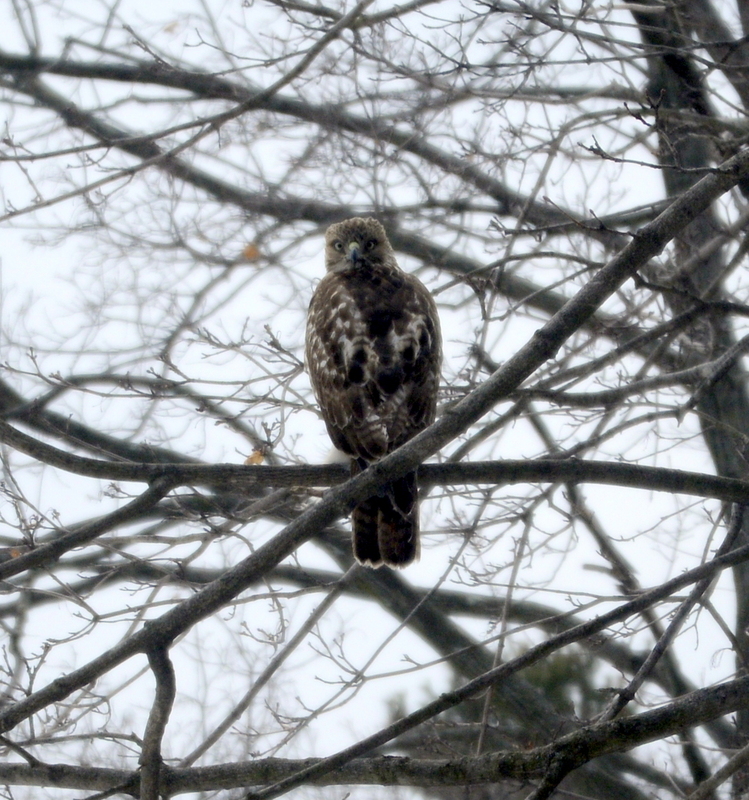 Is it a Cooper’s hawk once again? And isn’t it GORGEOUS! 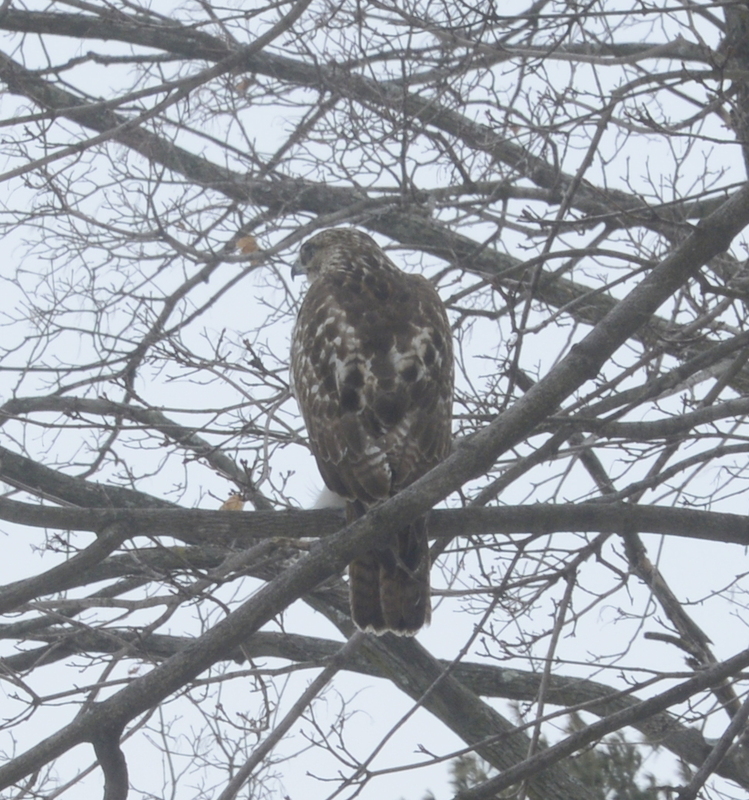 Addendum March 9: I’ve been told that this looks like an immature red-tailed hawk.